Starting in the mid–1800s, many transatlantic shipping companies repurposed their business and their ships to cater to passengers; the addition of electric lights, more deck space, and entertainment dramatically improved the experience of voyagers. When the British Medical Journal endorsed sea travel for curative purposes in the 1880s, the pleasure cruise industry was born and steamship companies promoted their services to a burgeoning class of global tourists. [Passengers] were to sail for months over the breezy Atlantic and the sunny Mediterranean; they were to scamper about the decks by day, filling the ship with shouts and laughter—or read novels and poetry in the shade of the smokestacks, or watch for the jelly-fish and the nautilus, over the side, and the shark, the whale, and other strange monsters of the deep; and at night they were to dance in the open air, on the upper deck, in the midst of a ball-room that stretched from horizon to horizon, and was domed by the bending heavens and lighted by no meaner lamps than the stars and the magnificent moon—dance, and promenade, and smoke, and sing, and make love, and search the skies for constellations that never associate with the “Big Dipper” they were so tired of; and they were to see the ships of twenty navies—the customs and costumes of twenty curious peoples—the great cities of half a world—they were to hob-nob with nobility and hold friendly converse with kings and princes, Grand Moguls, and the anointed lords of mighty empires! This seductive message was communicated in the late 1800s and early 1900s by way of excursion programs and poster campaigns. 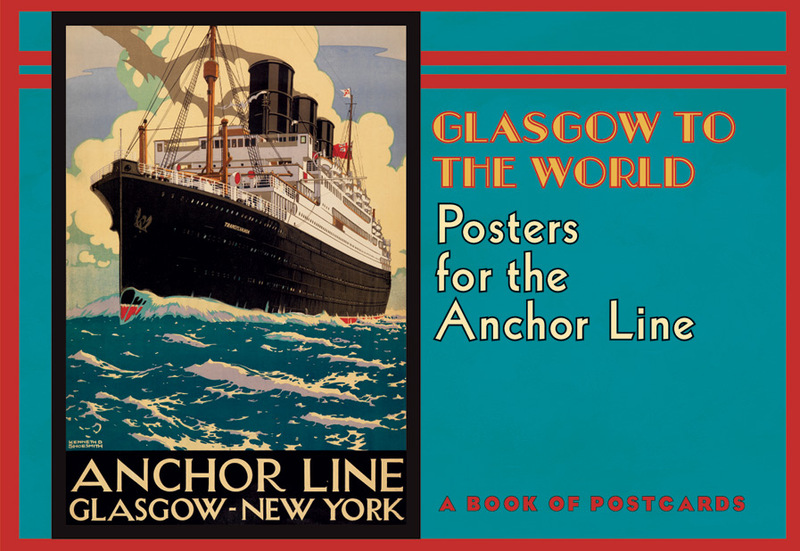 The Glasgow-based Anchor Line was an early competitor in the cruise-line business—having established services to American, Mediterranean, and Indian ports by 1869. The company published vividly colored posters depicting its sleek, newly built superliners—essentially massive floating hotels—as well as many exotic destinations. From the 1910s through the 1930s, the Anchor Line commissioned talented artists to create hundreds of posters—many of which are now held in the collection of Glasgow Museums—including the thirty posters selected for this book of postcards.